Two councillors joined bus company staff and council officials this week on a tour of Hawick streets to see how inconsiderate parking is threatening several local routes. Over the past few months several First bus journeys have been cancelled or abandoned as bus drivers have been unable to navigate their route thanks to persistent indiscriminate parking causing hazards. And on the entire route the pair witnessed almost 20 examples where thoughtless parking causes misery for drivers. Scottish Borders Council have issued a set of plans to road mark a number of hot spots with yellow lines and these will now need to go through a legal process before they can be implemented. But Mr Marshall is sceptical, adding that without enforcement, yellow lines are no use. He said: “After what we witnessed on Tuesday evening I certainly fully support this initiative but I am afraid they [yellow lines] are of no use at all if they are not actually enforced. 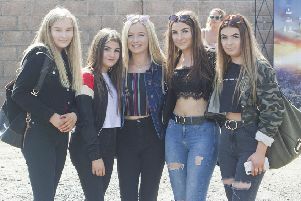 “Not only do we have a parking issue on some of these routes we also have a real safety issue with kids out playing on the streets, and while travelling through Burnfoot this was very much for all to see. “Both councillor McAteer and myself have agreed that we should meet with police and SBC officers as soon as possible to see how best to try and resolve the issue. Councillor McAteer added: “Having seen the problems bus drivers are facing negotiating the narrow streets of Hawick I am greatly concerned that our town service may be placed at risk unless we can find a way of making the route safer and easier to negotiate. “Indiscriminate parking at road junctions, blocking bus stops or vehicles being parked opposite each other make bus driving hazardous, if not impossible, and much more care and consideration is required by local drivers.